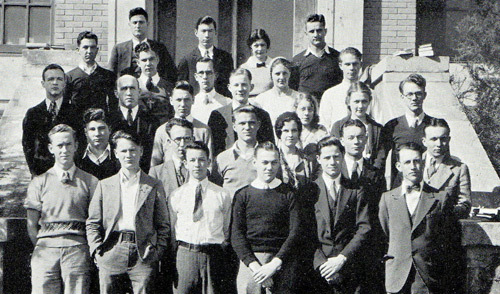 Professor Peggy Redshaw, a member of the biology faculty for more than 30 years, wrote the following summary, highlighting some of the faculty and students in the sciences at Austin College from 1910 through 1940. The biographies, along with photos, scientific equipment, and botanical specimens were part of a fall 2011 exhibit in Abell Library, organized by Redshaw; John M. Richardson, assistant professor of chemistry; and Pat Means, Abell Library supervisor of interlibrary loan. A fall 2012 exhibit will offer faculty and student stories from approximately 1940-1970. Two of the early chemistry faculty members were Charles Carrington Scott and Bradshaw Frederick Armendt. Professor Scott, the MacGregor Professor of Chemistry and Physics, earned his A.B. in 1888 from Hampden-Sydney College and studied at the University of Heidelberg. He joined the faculty at Austin College in 1889 and remained until 1926 when he retired due to illness. When Professor Scott began his career, he served as the College’s commandant during the first year of the school’s military program. Professor Scott was ecstatic when natural gas lines were added to the chemistry labs in 1902. Scott not only taught chemistry courses, but at times physics, biology and geology. When the Old Main building was burned on January 21, 1913, he lost an estimated $5,000 of lab equipment for his chemistry courses. As a consequence, his chemistry courses met in the YMCA building until Thompson Hall was completed in 1914. Following in his chemistry professor’s footsteps was Dr. Armendt. A 1921 graduate of Austin College, he earned the M.A. in chemistry in 1922 and an M.S. in chemistry from Vanderbilt in 1923. He returned in 1924 and served on the faculty until 1934. He sponsored the first Pre-Med club for students as well as the C. C. Scott Chemistry Club. On the retirement of Professor Scott, Armendt became the MacGregor Professor of Chemistry in 1927. Armendt earned the Ph. D. in Chemistry from University of Texas at Austin in 1933. In 1934, due to the impact of the Great Depression on the College, he left for an industrial position as a research chemist with Humble Oil Company in Baytown, Texas. Armendt had several patents when he retired in 1964 from Humble Oil & Refining. In 1966, he was awarded a Meritorious Service Award from the College. The first two deans of the College taught mathematics. Llewellyn J. Mitchell, Chadwick Professor of Mathematics, joined the faculty twice, once from 1890 – 1897, and he returned for 1911 – 1924. He was trained in mathematics at Westminster College, earning the A.B. in 1885 and a master’s degree in 1891. In 1916, he was appointed the first Dean of the College by President Clyce. Walter Hugh Drane, trained in mathematics, English, and civil engineering, joined the College in 1924 to teach mathematics and served as the dean of the College for 11 years. Dr. Walter White Steffey joined the Austin College faculty in 1924 and taught physics until his retirement in 1960. Dr. Steffey earned the A.B. in 1913 from Emory and Henry College and the Ph. D. in 1923 from Johns Hopkins University. One of his first classes at the College was a course on the structure of the atom and spectral lines—taught in German, using a German textbook. At the depths of the Great Depression, he was relieved from teaching at the College for two years. He returned to the College as times improved, and taught the ground school for pilot flight training as WW II threatened. In reminiscing about his career, he spoke about the development of cars, seeing his first movie, and seeing Halley’s Comet as a boy in 1910. He died in June 1992 at the age of 100. Another longtime faculty member of the college was James B. Moorman. Moorman earned an A.B. in 1920 from Randolph-Macon College and an M.A. in 1930 from The University of Texas at Austin. From the time of his appointment to the College in the early 1920s until the late 1940s, Professor Moorman was, with only an occasional adjunct instructor, the lone faculty in the Biology Department. Moorman was addressed as “Dean” or “The Dean” by his students and colleagues. These were not only titles of respect, but also reflected the affection and esteem in which he was held by all who knew him. Dean Moorman was appointed the Dean of the College in 1935 after a tragic incident occurred. Just before commencement, several students broke into the chemistry labs and drank from a supply of wood alcohol. Two students died. The surviving students would talk only to Professor Moorman about this episode. 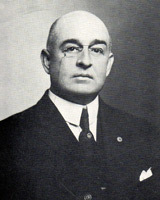 Austin College President E. B. Tucker was so impressed by Moorman’s handling of the incident that he appointed him dean. Moorman was awarded the Austin College Distinguished Service Award in 1958 and the Austin College Founder’s Medal in 1974. His ability as a raconteur was legendary and among his students and colleagues, an opportunity to tell Moorman stories is never missed, even today. William Thornton Read, Class of ’05, was the first Austin College graduate to earn a Ph.D. in chemistry, at Yale in 1921. He went on to found the Department of Chemistry at Texas Technological College in 1925 and served as chair of the department until 1930. Additionally, he served as the dean of the School of Chemistry at Rutgers University. Percival Keith, Class of ’19, graduated with an English degree at the age of 19, after being enrolled for only three years. He studied chemistry at Massachusetts Institute of Technology, where he began his fast-rising career in chemistry, particularly in oil refining. He developed a catalytic reforming process, known as Hydroforming, which was the major source of toluene for the production of TNT during the early years of World War II. Immediately after the attack on Pearl Harbor in 1941, Keith was invited to join the planning board of the Committee of the Office of Scientific Research and Development. He directed the development of the gaseous diffusion process for separating uranium-235, one of several processes being considered to produce materials for the atomic bomb. The gaseous diffusion process he pioneered is the most widely used process for enriching uranium-235. By the time of his death in 1976, he held more than seventy patents. Austin College recognized his dedication to science with an honorary Doctor of Science in 1946. Read more about Percival Keith. George Landolt, Class of ’25, earned his Ph. D. in Chemistry at the University of Pittsburgh before joining the Austin College faculty in 1934 as a chemistry professor. Out of necessity, he soon moved into the role of business manager, where he worked tirelessly to keep the College solvent during the Great Depression. Eventually he became vice president of the College before returning to the classroom to teach chemistry. Truman Graves Blocker, Jr., Class of ’29, earned his medical degree from the University of Texas Medical Branch (UTMB) at Galveston in 1933. From 1942 to 1946, he served as a military surgeon in the Air Force and Army. After the war, he returned to UTMB as chief of a new division of plastic and maxillofacial surgery. Between 1937 and 1973, Blocker authored or coauthored 182 publications, most of which dealt with the care of burn victims. Dr. Blocker was conferred with a Founders Medal during the celebration of the 125th year of the College. Joe Dennis, Class of ’33, was born in Sherman and earned a B.A. from Austin College and an M.A. and Ph.D. in biochemistry from the University of Texas at Austin in 1942. Dennis changed the Chemistry Department at Texas Tech from an undergraduate teaching department into one in which research and graduate studies were stressed. He served as head of the department from 1950 –1969 and remained at Texas Tech until his retirement in 1976. Royston Roberts, Class of ’40, devised and patented a new synthesis for chloroquine, an anti-malarial drug, which was implemented commercially for use by our armed forces in WW II. Amazingly, it is still in use for the synthesis of this drug today. He spent his career (1947 – 1996) at the University of Texas as professor of chemistry. The library exhibit also included scholarships and fellowships funded by students from the 1910 –1940 era that are awarded to Austin College students of today. Beatrice Brittain Bird, Class of ’34, of Sherman gave a gift to the Austin College Biology Department. The Brittain Memorial Biology Student Research Endowment greatly strengthens the biology program by providing support for a significant number of faculty-student research projects. Marion Cox, Class of 1927, earned a B.A. in chemistry and returned to complete the M.A. in chemistry in 1934. Marian taught physics and chemistry in El Dorado, Arkansas, from 1927 – 1971. 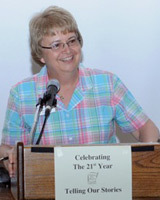 The Marian A. Cox Chemistry Fund was established in 1990 to enhance the chemistry program of the Austin College. Hundreds of students have directly benefited from her donation in the form of research, education, and travel support. Arthur Springall, Class of 1929, was awarded the M.D. in 1935 from UTMB in Galveston. The Dr. Arthur N. Springall Fellowship was established in 1998 and is awarded to a rising senior who plans to attend medical school.